If you’ve been noticing blurred vision and strong glare, there is a chance you are learning what keratoconus is first-hand. 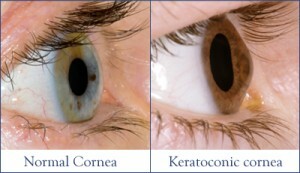 Keratoconus is a disorder of the anterior surface of the eye (the cornea). When the cornea becomes rippled, it bulges and creates distorted vision. This bulging interferes with the person’s vision and can make everyday tasks like reading, watching TV, and other activities very difficult. The condition can progress quickly or slowly. Early stages of keratoconus may cause distortion of vision, double vision, and halos around lights. Patients can be misdiagnosed as having a severe irregular astigmatism, when in fact they may be dealing with keratoconus. When suffering from moderate to severe keratoconus, decreased vision cannot be corrected with glasses and can cause patients to be contact lens intolerant. Here at Stahl, however, most keratoconus patients can achieve functional vision with our specially designed contact lenses. Because of the cone-like shape of the cornea in patients with keratoconus, regular contact lenses will not work for them. Specially designed keratoconus contact lenses can help patients see better. After evaluating the cornea with topography maps, we can determine which lens is the best for each person’s situation. The answer lies in which lens option delivers the most comfort. Lenses today can be comfortable, provide optimal vision and can be worn for long periods of time. Collagen corneal cross-linking is another procedure that treats keratoconus. This procedure is FDA-approved and has proven very effective for patients with keratoconus. While a normal cornea has collagen cross-links that help retain its shape and strength, the cross-links in patients with keratoconus are weak and unable to retain the corneal shape. During the corneal cross-linking procedure, the advanced technology treatment will strengthen the cross-links in the cornea. This procedure will prevent contact lens discomfort, further loss of vision and the need for corneal transplant surgery. A third treatment option would be to undergo corneal transplant surgery. Candidates for this procedure include patients who experience thinning of the cornea and painful swelling that does not subside. These individuals may also find that their vision impairment can no longer be corrected with specialty contact lenses. Stahl’s Contact Lens Practitioner, Galo Andrade, has been successfully helping patients with advanced keratoconus for over a decade. An active member of the Contact Lens Society of America and an active participant in the Specialty Lens Symposium, he specializes in working with patients with keratoconus, keratoglobus, pellucid marginal degeneration, corneal dystrophies, Sjogren’s syndrome, and post-surgical corneal graft rehabilitation.